Oh. My. GOSH. Please tell me those are unused diapers. If they aren’t, please tell me the boys wisely chose the diapers and there was no poo flinging. Yes, they’re unused. Which only makes me feel a LITTLE better. the pamper girl one is my fave. still i wonder, aren’t those absorbant crystals in disposable diapers from the same material one finds in popcorn ceilings? sorry my mind wanders a bit when i am tired. OK.. I will not complain anymore about my kids scattering the (clean) diapers all over the room. Because you have 3 boys I completely can see how this happens (must have been some sort of fun game they made up- I know those games!) And I still think that Jeana’s captions are the BEST! Hilarious! Who needs air freshener when you have a diaper-fanner? They knew the cr@p was going to hit the fan so they prepared as best they could. Doesn’t everyone have diapers hanging from their fans???? My boys love to throw things on top of the one in their room. You turn the fan on and then duck. You can never be sure what may go flying across the room. “Rockin’ around the diaper tree””Dooty in the wind””Tired of all those floral scented air freshners?””New baby”, the smell every parent knows and loves! p.s. Was there a real explanation behind the photo??? Well, that’s one way to keep the baby out of the diaper supply! Your home looks beautiful. Love the walls, and the way the bookshelf integrates into the panel design. Is this a new way to break open the pinata?! Seems safer than giving children a big stick with a blindfold on. Two thought immediately came to mind when seeing this one…. The “Fanny Diapers” are too funny. It reminds me of the time my Dad taught my sister and I that my Mom’s bras belonged on the ceiling fan. Hehe. That was too fun! That is too funny! I love all the captions that people thought of. My mind is blank. 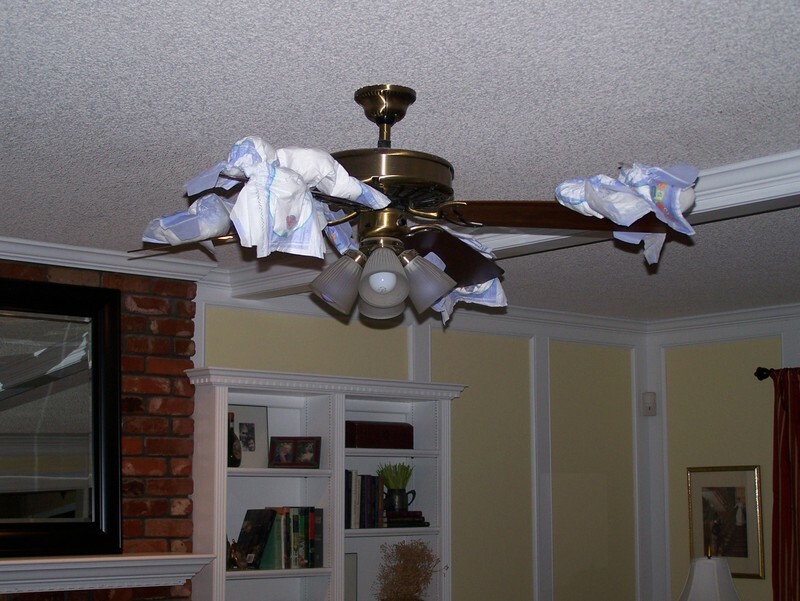 Hunter ceiling fans try to compete with the diaper genie. The comments already listed make me LOL! ALL I can say is been there, cleaned that up. Oh my goodness that is funny. I guess when you complain about the cost of diapers going higher this is what they think of. Rocks, you gotta buy your boys some toys. LOL that is sooooooo funny! Dare I ask how they actually got them up there? That’s too funny. Love the caption ideas…I can never think of anything clever. Next time use cloth ones, Mrs. Dryer. And now you know why I found socks on the topmost shelf in their room. cute stuff. My kids have thrown stuffed animals on fans too. Funny fan story – my wedding dress was hanging from my parents’ fan the night before my wedding. My dad accidentally turned it on. His shrieks brought everyone upstairs, expecting to find him injured. Nope, just my dress swirled in a tight whip. The new diaper drying system. Perfect for reusing only slightly soiled diapers. I am so glad my boys haven’t gotten to that age (yet). Very creative – my kids just like wearing them as hats! my boys would put stuffed animals on our fan till one day the one thing (what are they called, arms?) anyway, the one thing fell off. Now that there are only three arms and the fan is totally broken they want nothing to do with it. Wow. There’s something about that that makes you proud though. There’s GOT to be a baby shower game in this somehow. My son stuffed his wet pullups down the living room air vent. How I didn’t see or smell them is beyond me. Pulled ’em out (about 6 of them) with BBQ tongs. Does your roof leak when it rains? Try the absorbant, quiet way to catch those annoying leaks! And avoid tripping over those full pans when you get up to use the bathroom in the middle of the night! That scares the livin’ daylights out of me (I’m laughing at the same time). I have a 3 year old and 20 month old triplets and I can picture that at my house. Seeing this makes me feel a little better about the crazy things my kids do to our house. I’ll be sure not to show this to my son. Ever. Definitely a picture for the scrapbooks! I don’t want to wait till the end of Summer 😦 , I want it now. Who with me?